Previously hidden aspects of the Church of Ireland’s input and influence on the Irish Convention which opened in Trinity College Dublin one hundred years ago (on 25th July 1917) are brought to light in a new online exhibition from the RCB Library – the Church’s record repository and reference library. The Irish Convention is significant because it was the last time that all of Ireland participated in political negotiations to find a solution to the Irish question before Partition in 1921. By initiating a gathering of Irishmen to decide their own political destiny, the British Government’s ostensible objective was to keep nationalist and unionist Ireland together as a single political entity (albeit at this point within the British Empire). The Government invited the two Church of Ireland archbishops of Armagh and Dublin – John Baptist Crozier and John Henry Bernard – to attend. Additionally the Roman Catholic hierarchy was represented by the Archbishop of Cashel and three other bishops – of Down, Raphoe and Ross – and the Presbyterian Church in Ireland by its Moderator. Once in session, the proceedings of the Convention were strictly secular – there were no prayers or religious formalities as part of the proceedings. Nevertheless, the juxtaposition of the church leaders among the political leaders in the front row of the official photograph that appeared in August 1917 (reproduced in the online exhibit courtesy of the National Library of Ireland) signals how highly-valued their input to the Convention was considered in political circles. The Church of Ireland, then as now an all-island institution, and including members of all political persuasions and none, appears to have been deeply committed to support the Convention and promote the stability it offered, particularly in the aftermath of the Easter Rising of 1916. The exhibition draws on the rich resources of the weekly Church of Ireland Gazette, now digitized and freely searchable online between 1890 and 1923, for insight to what could be considered as the moderate and middle-ground opinion being written and read by its members and others during this period. It reveals that for the duration of the Convention’s deliberations, the Gazette continued to be edited by Warre Bradley Wells. Wells had witnessed first-hand the events of the 1916 Rising from inside the paper’s premises on Middle Abbey Street – initially writing up the graphic detail in the columns and editorials of his paper, and then co-authoring one of the first contemporary histories of the 1916 Rebellion: A History of the Irish Rebellion of 1916 (published Dublin, 1916, and New York, 1917). Significantly, as the exhibition demonstrates, Wells co-authored the first independent contemporary record of the proceedings of the Irish Convention written in the immediate aftermath of its demise in March 1918, which was actually published as a sequel to his history of the Rising, as The Irish Convention and Sinn Fein, in Continuation of “A history of the Irish rebellion of 1916” (Dublin, 1918). Whilst this book would lament what could have been achieved had the Convention succeeded, back in July 1917 through the pages of his Church of Ireland Gazette, Wells used his editorials and lead articles to foster hope: ‘The Convention has in its power to rescue us from our tragic confusion’ he wrote on the eve of its convening, in the 20th July 1917 edition’s lead article. 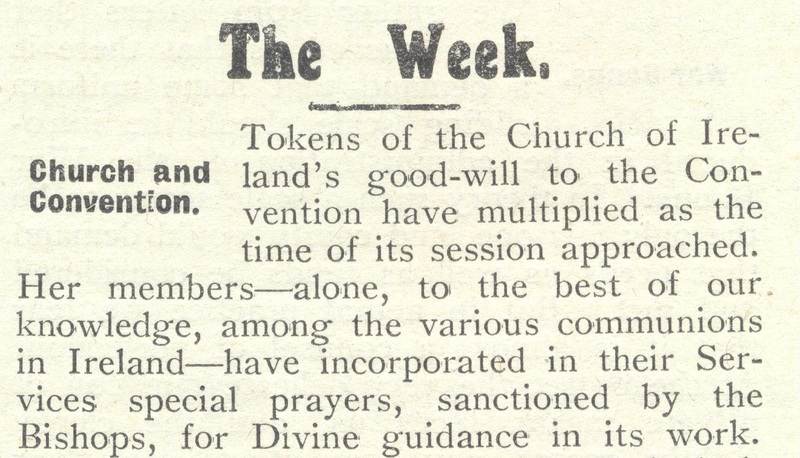 Aspects of the Church of Ireland’s input to the Convention provide the lead in “The Week” column, Church of Ireland Gazette, 27th July 1917. In the next edition, published on 27th July 1917, two days after the Convention got under way, the paper’s opening ‘The Week’ column was pleased to report the first day’s proceedings had resulted in the ‘happiest omen’ with the unanimous appointment of Sir Horace Plunkett as Convention chairman, adding with some pride that Plunkett was ‘a member of our Church’. The paper further reveals that whilst the actual proceedings of the Convention did not contain any religious content, the Church of Ireland appears to have hosted a pre-Convention ‘special Service for delegates in St Andrew’s Church, Suffolk Street’. Rather than use the adjacent chapel building within Trinity’s precincts, added political symbolism was provided by staging the service in what had been the parish church for the Irish Houses of Parliament. The only detailed report of this service appears in the Church of Ireland Gazette on 27 July 1917, which observed how ‘Wednesday’s Service’ appeared to revive the old tradition being ‘the first Service of the kind since the Act of Union’, and was well attended: ‘about one-third of the congregation were gentlemen chosen to deliberate on the future of Ireland’. Other interesting stories of Church of Ireland significance presented in the exhibition include Wells’ revelation that the operating procedures to regulate the work of the Convention were in fact modelled on those of the General Synod of the Church of Ireland, with Archbishop Crozier selected as ‘Chairman of the Procedure Committee’, while the typescript memoirs of the RCB Library’s founding benefactor – Rosamond Stephen (1868-1951) – include a personal and hopeful exchange of correspondence with Sir Horace Plunkett on the eve of the Convention, and its opening day. The personal diary of Rosamond Emily Stephen (1868-1951) entitled The Record 1902-1940 includes her personal reflections on the Convention and copies of her correspondence to and from Sir Horace Plunkett on the day the Convention opened, © RCB Library Ms 253/4. The RCB Library gratefully acknowledges the Department of Arts, Heritage, Regional, Rural and Gaeltacht Affairs for supporting this online exhibition, and covering the costs of hosting the Church of Ireland Gazette search engine online to the end of the Decade of Commemorations in 2023.